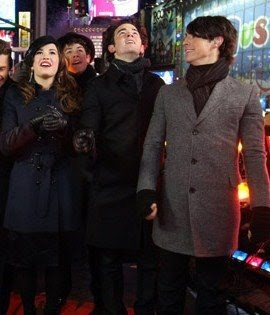 Demi Lovato says the Jonas Brothers are some of her best buds. In Seventeen Magazine, she spills "I even put on my glasses and wear sweatpants around them, because you wouldn't put makeup on for just your brothers." A source says, "On New Years, they couldn't stop laughing and smiling when around each other. They seem to have a really close bond. I actually haven't seen Nick smile so much before. When the boys and Demi are together, they seem to have a good time."